This Nut-Free Keto Bread is a delicious low-carb and allergy-friendly bread to enjoy without being kicked out of ketosis! Traditional breads not only contain a high level of carbohydrates, they can also have many unwanted ingredients like gluten, soy, and even high fructose corn syrup and other refined sugars. 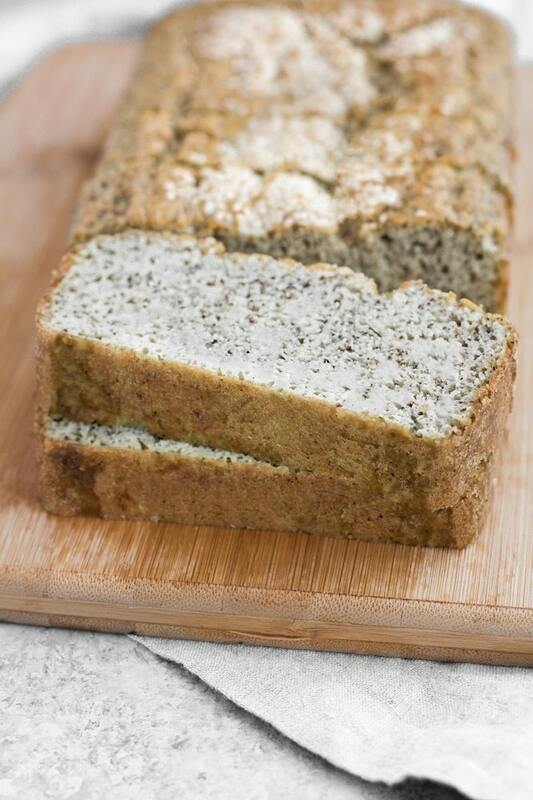 Unlike store-bought breads, this Nut-Free Keto Bread is both low in carbs and nutrient-dense! Ryan and I like to enjoy a slice with SunButter or grass-fed butter spread on top. Not only is it absolutely tasty, a slice is a perfect small breakfast or snack option that keeps us full and focused throughout the day! This recipe, like many of my other nut-free recipes, is made without almond flour, which many keto breads contain. This bread is made with coconut flour, making it nut-free and safe to consume for those with a nut allergy or nut intolerance. Additionally, unlike many other keto breads, this Nut-Free Keto Bread is also dairy-free and paleo-friendly! 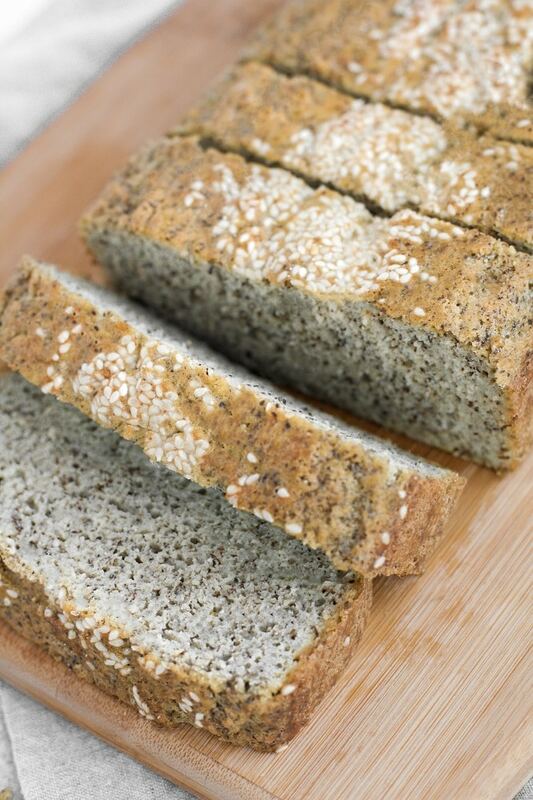 This Nut-Free Keto Bread is the ultimate keto-friendly bread recipe to have on-hand, especially for those who follow a dairy-free, low-carb, and nut-free diet! 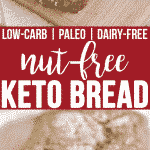 Low-Carb and Keto: One slice of this Nut-Free Keto Bread contains only 2.9 grams of net carbs per serving. 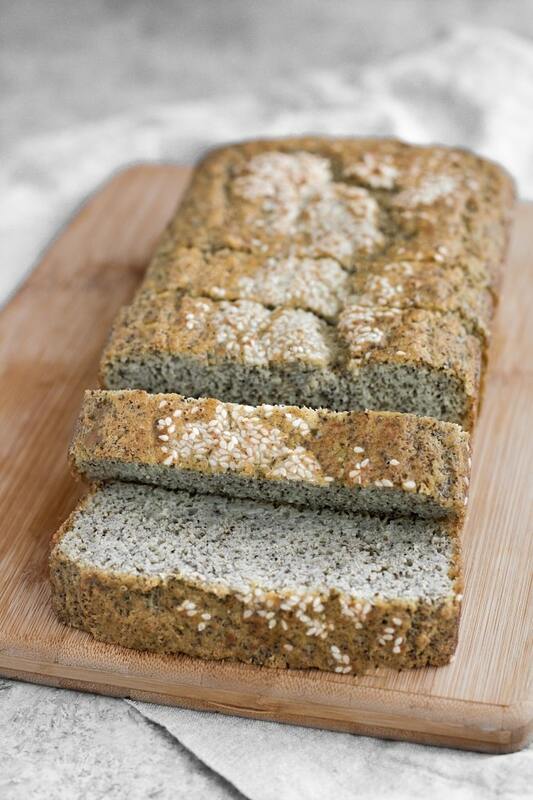 Nut-Free: This recipe uses coconut flour, making this bread a perfect choice for those who have a nut allergy or nut intolerance. Paleo: This recipe does not contain gluten, grains, soy, or dairy and is therefore paleo-compliant. 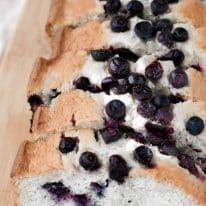 Dairy-Free: Unlike many other keto bread recipes, this recipe is entirely dairy-free. Vegetarian: This recipe is compliant with a vegetarian diet. One slice of bread contains 2.9 grams of net carbs per serving. One loaf of bread yields approximately 8 slices. 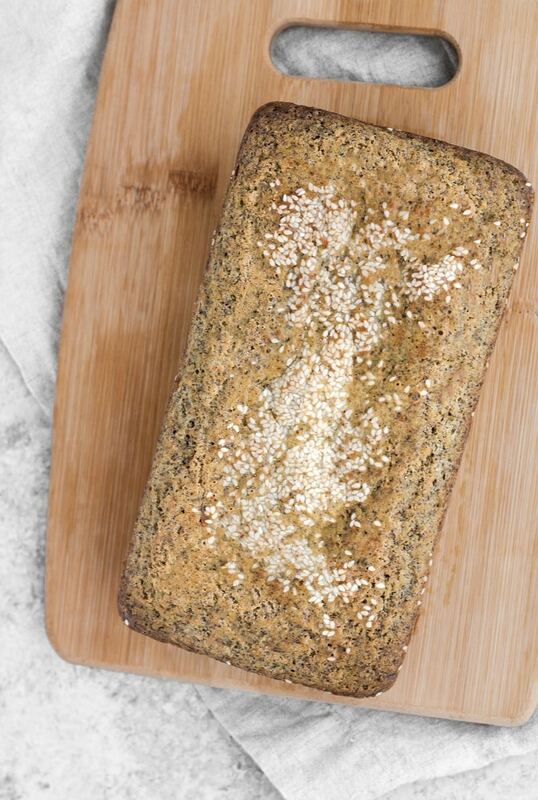 This Nut-Free Keto Bread is keto, low-carb, nut-free, paleo, dairy-free, gluten-free, grain-free, vegetarian, and refined-sugar-free. You can find more Real Balanced nut-free recipes here! This Nut-Free Keto Bread is a delicious low-carb and allergy-friendly bread to enjoy without being kicked out of ketosis! 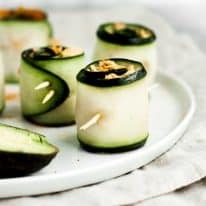 This recipe is keto, low-carb, nut-free, paleo, dairy-free, gluten-free, grain-free, vegetarian, refined-sugar-free, and contains only 2.9 grams of net carbs per serving! Preheat oven to 350 degrees and grease 9×5 bread loaf pan (* see note below). To a mixing bowl, add eggs and, using an electric mixer, mix on high for 2 minutes. Add coconut oil and mix on high until well-incorporated with eggs. To a separate bowl, add dry ingredients and whisk together. With electric mixer turned to low, slowly add dry ingredients to wet ingredients and mix until fully incorporated and dough is formed. 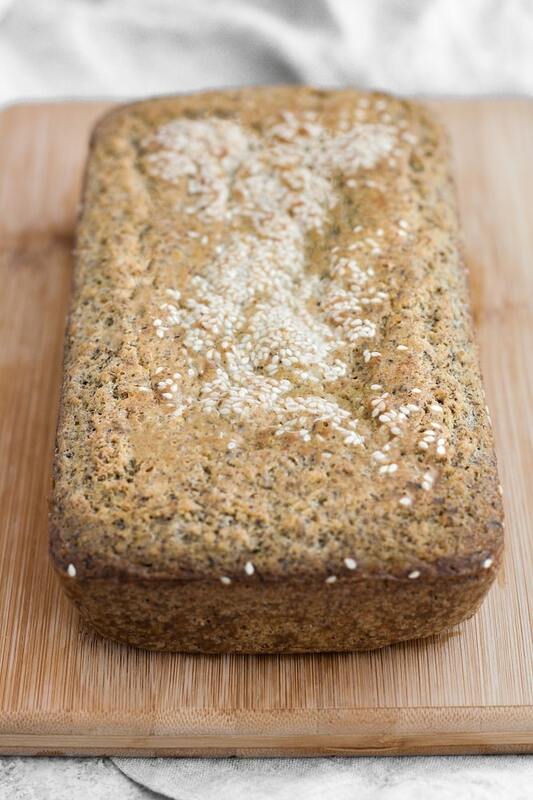 Pour dough into prepared loaf pan, top with sesame seeds, and bake for 35 minutes. Remove pan from oven, carefully flip pan upside down on to cutting board or plate to remove bread from pan, and allow bread to cool completely before cutting into slices. * To ensure pan is well-greased and that bread will not stick, I suggest brushing 1-2 tsp melted coconut oil on all edges of the loaf pan and placing it in the freezer to solidify. I’m wondering if I can use 4 tsp of baking powder instead of the separate baking soda + cream of tartar mixture? I don’t know why, but I can’t find cream of tartar in any of my local stores. I also found an Australian recipe where the woman used sparkling water plus 2 tsp of baking powder…comparable? That same recipe used only 6 eggs (plus some tapioca starch). I wonder, if I double the xanthan gum, would I be able to use only 6 eggs? Also, you didn’t specify what size of eggs to use? Last time I did a coconut flour recipe with 2/3 cup of flour & only 7 eggs, and I wound up with the flavor of an egg bagel. Barf! I really don’t want to waste ingredients like that, again. That’s why I ask. Cream of tartar is found in the spice aisle of grocery stores (it looks very similar to baking soda and baking powder). I don’t bake with baking powder, so I can’t say for sure if that sub will work, but I would venture to say you’d need solely 2-3 tsp of baking powder and you could altogether omit the baking soda. Eggs that are called for in American recipes are virtually always large eggs. I have no idea if the recipe would be successful if you lessened the eggs and doubled the xanthan gum since those are entirely different ingredients, which would basically be a completely new recipe than this one. If you didn’t enjoy the other bread recipe that was egg-based, I would say this recipe isn’t for you. No, coconut is a fruit (a drupe, technically). It’s often mistaken as a tree nut, but it’s not. You can read more about this on the ACAAI website. Hi. I would love to make this recipe. Do you have a version of this recipe with an egg substitute? I have a severe intolerance to eggs… and gluten, soy and dairy. 🙁 Thank you! Hi, Carlee! I wish I did, but the eggs are an essential component to this bread recipe. Take a look at this recipe for Vegan Keto Bread Rolls though (they are egg-free)! I’m so happy to hear that, Guna! Thank you for taking the time to leave a comment and recipe rating!!! ? 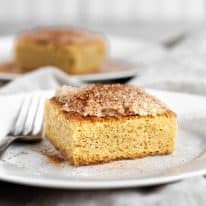 I have tried several keto bread recipes and this one is by FAR the best. I added a teaspoon of garlic powder and a few springs of dried rosemary for a different twist. Either way – fantastic! Thanks for this great nut free recipe! Yay! So happy to hear that you enjoyed the recipe, Dana! Thank you so much for taking the time to leave a comment and a recipe rating! Hi, Fiona! Unfortunately, I don’t! This is the first I’m hearing of this product, but it looks pretty neat! You are missing ingredients for this recipe. It DOES NOT WORK with only 2/3 cup of coconut flour. No dough cN be made with so little flour base. Hi, Denise! There are no ingredients missing here; this is the complete recipe. ? Denise, if you have never baked with coconut flour, it doesn’t take much! It’s extremely absorbent. All recipes with coconut flour have a similar balance to this one. This was so tasty. Followed the cvcxxcc recipe provided and it turned out great! I will be making this a lot. So glad you enjoyed, Debbie!!! Just tried this bread and it turned out pretty well. I made a couple changes, just based on preference and on hand items: used solid coconut oil (just melted it), used 2 tsp Psyllium & omitted the xanthan (don’t like this gum), ground up my own sesame seeds to make flour (not too fine), added a few tbs sesame seeds, chia seeds & hemp seeds after spreading the batter in my bread pan,(as an after thought, I should have combined it in the processor) then I sort of mixed it in with a spatula, cause I put way too much on to just leave on top as a coating. The result looks pretty much like the picture….just had some warm from the oven with a little butter and it was very nice. It definitely has that quick bread texture, but a nice addition to my repertoire. Thanks for posting! I’m so glad you enjoyed, Maria! Thank you for taking the time to share how you made the recipe your own & for leaving a recipe rating! I appreciate it so much!! !